On Long Island, police say someone cut a hole in a fence and took a hybrid wolf. Greg Cergol reports. 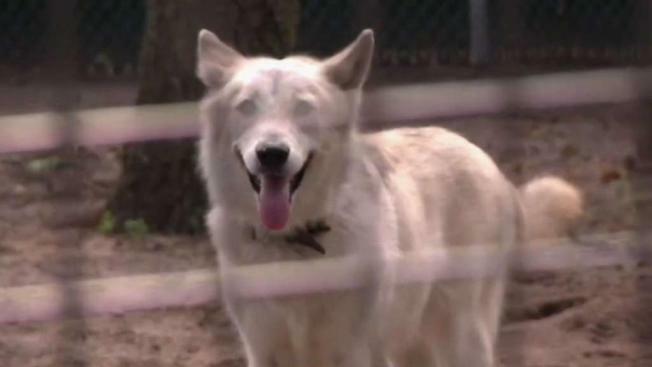 Authorities are investigating the apparent theft of a wolf hybrid from an ecology park and animal preserve on Long Island. Police say an employee at the Town of Brookhaven Ecology Site, Park & Animal Reserve in Holtsville, New York, called 911 just before 7:30 a.m. Monday to report the animal, which had been caged, was gone. A source familiar with the investigation tells News 4 the thief cut through three fences to take the wolf. The wolf is a 7-year-old female named Nakita; it had been illegally kept as a pet at a Ronkonkoma home until last year. The owner turned it over after it became aggressive, authorities said. According to Roy Gross of the Suffolk SPCA, Nakita has shown no aggressive behavior to humans since being turned over. Sources tell News 4 the theft could be an inside job since the thief, or thieves, had knowledge of how to reach the wolf. "This animal was targeted," Det. Lt. Michael Lutz, of the Suffolk Police Department, said. It remains unclear if the animal was simply set free. There were no apparent threats or complaints about keeping the wolf in captivity, sources say. According to a county website, the Brookhaven facility has more than 100 injured or non-releasable wild and farm animals that are available for public viewing. Suffolk SPCA is offering $5,000 reward for information leading to the arrest and conviction of the thief or thieves. Brookhaven Town Highway Superintendent Daniel Losquadro said in a statement that the Ecology Site is "extremely concerned for Nakita's welfare." Losquadro further urged the public that even though Nakita did not exhibit agressive tendencies toward people, including her caregivers at the Ecology Site, "we are asking the public not to approach her, if seen."